Tom: Hi Jason, remind us about Jason Tagmire. 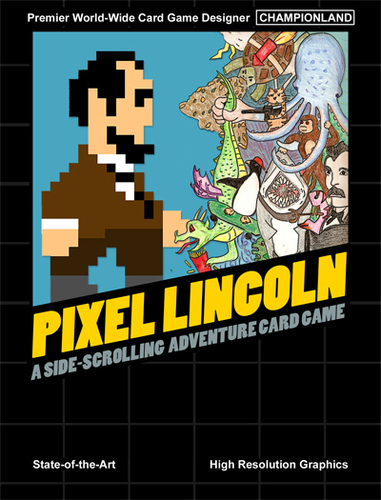 Jason: Hey, I’ve designed some quirky games like Pixel Lincoln, Maximum Throwdown, the Storyteller Cards d ecks, and I was co-set designer on Quarriors: Quest of the Qladiator. Tom: First, update us on Storyteller Cards. I sadly missed both KS so I want to know more. Jason: Storyteller Cards are playing cards designed to inspire creativity. It’s essentially a pocket toolkit for writer’s block, creative gaming and general storytelling no matter which medium you choose. Cards have an illustration loaded with story elements (character, item, action, location… and in the fantasy set we added race, class and weapon). Along the corners of the cards are gaming elements (card rank/suit, emotions, seasons, coins, dice, etc..). You can use these to do anything you want, and we’ve put together a bunch of games and exercises to get people started. It’s all very open-ended. Tom: You have two hot games right now. The first is Pretense, which just finished a successful Kickstarter campaign. Give us the elevator pitch for the game. Jason: Pretense is a game night social metagame that players before, during and after other games. Each player assumes a secret role and has the entire night to achieve their special goal. Except, roles are like “The Glutton: If another player hands you food or drink, you may take their role card” or “The Maid: If you are the only player to clean up a game, you may take any other player’s role card”. Fun stuff that plays on game night behavior. The next game has just launched on Kickstarter. It’s Seven7’s and Eagle & Gryphon is publishing it. 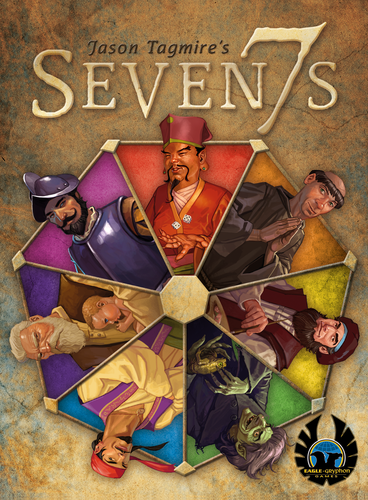 Seven7s is a card game where players use the powers of seven famous sevens (7 wonders, 7 deadly sins, etc..) to try and build the most powerful hand for endgame scoring. 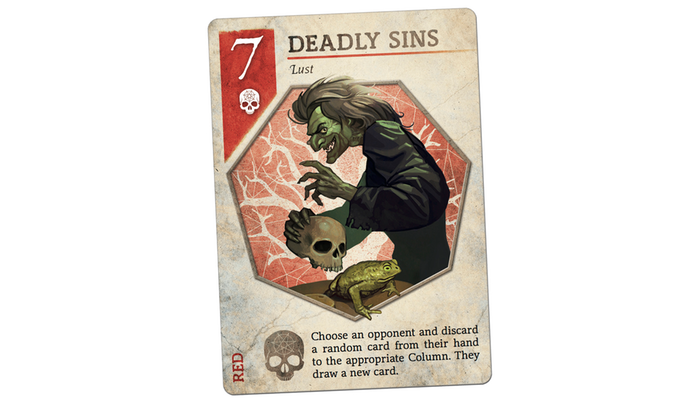 The sevens do all kinds of things from swapping cards to gaining knowledge to disabling specific card values. It plays in about 20 minutes, at which time you’ll hopefully want to shuffle up and play again. Tom: What’s the story behind Seven7’s? Where did the idea come from? Jason: Seven7s came from a pitch tag session with Alex Strang and Kevin Kulp. If you aren’t familiar with Pitch Tag, it’s a little exercise created by Daniel Solis and Fred Hicks where someone comes up with a title and you create the game. We play it via email / Facebook messaging all the time and I’ve noticed that I am best when I come up with the title. The big difference is that now you aren’t trying to get a set. You are trying to end with the highest hand value. But 4 out of those 5 suits made it into the final game. Tom: What was the most challenging part of designing Seven7’s? Jason: Coming up with 7 unique card powers that each had a different feel. The game space is pretty small, so there aren’t a lot of components to work with. You have your hands, the columns of cards, the deck, and an area for point cards. It’s a little tight, but the theme was awesome and gave me a ton of flexibility. Examples: How does a Wonder work? Well “wonder” is about the unknown and gaining knowledge, so I made it about seeing other players cards. Deadly Sins hurt people. Ages of Man speed up the game clock. Seas move cards around. Once I got to that point, the game opened up quite a bit. Tom: How did you land it with Eagle & Gryphon? Jason: I brought it to Unpub 4 and was lucky enough to have Ralph Anderson in on one of the early tests. He was pretty excited about it and played a few times. Then somehow he started demoing it at my table while I was off playing other games. I must have had the 7 Lucky Gods on my side, because it worked out very well. Tom: I’m really looking forward to seeing Seven7’s. It looks like my kind of game. Now for some general game design questions. What is the least fun part of designing a game? Jason: I always said writing rules, but I think I’ve embraced it recently. But what that being said, it’s still totally boring. It gets even worse when you are doing the graphic design for rules and the entire layout needs to shift about 100 times. I’m not a fan of rules. Tom: I write protocols at work all the time. I’m pretty good at it. I should be good at writing rules. Now, what is the best piece of feedback you’ve received from a playtester? Jason: Comments like “this game is broken” are pretty impactful, but to me the best feedback is the feedback that confirms your suspicions. When something feels off and the players confirm it. It’s also very helpful when common trends show through multiple play groups. It’s sometimes tough to nail things down when one player has a bad experience, but when multiples do it’s a huge eye opener. Jason: It’s very fulfilling. Which is not to be confused with Kickstarter fulfillment. That isn’t fun at all. But designing games has a very quick idea to implementation time period. I can think up a concept, print it and test it within the same day if things go very well. I love shooting out ideas and seeing where they end up. Designing games allows me to do that in a way that involves interacting with other people, unlike most other creative mediums that are created then absorbed by other people. Board games are two-way and I love that about designing them. Jason: I would say “add to” as I always start small and build up from there. My games usually start as little nuggets that leave me with the question “what else does this need?”. I rarely have a huge game that needs to be cut down due to mechanics, but on the other hand I always have big stupid ideas that are completely unfeasible and unplayable. I try to whittle them down and they often lose what makes them special. Pretense was one that started out as a goal to make a game that plays during other games, but one that was too silly to even work. As soon as I explored the meta side of things, it all clicked. But there are a whole bunch of others that didn’t click that are absolutely terrible. Jason: There are a few big ideas that are bouncing around, and there’s one that’s going to be published soon. I don’t play a lot of huge games, so I naturally don’t make a lot of huge games. But I do have some that I’ve been tinkering with. The other side of it is that I usually design to my resources and limitations. 54 cards can go a long way so I start there a lot of times. Jason: I personally bounce back and forth and can’t tell if either is more important as a starting point. I believe they are equally important by the end, and should be as seamlessly integrated as possible. Sometimes part of a game just doesn’t make sense thematically and you need to take a step back and see if there’s a better way to do it that will keep everyone wrapped into the theme. Jason: For Seven7s it was when I added the Seven Ages of Man. The game plays pretty straight, you are playing cards for their powers and trying to get the highest valued cards in hand. At the end of the game, the highest hand wins. Well, the Ages of Man’s power goes two ways. 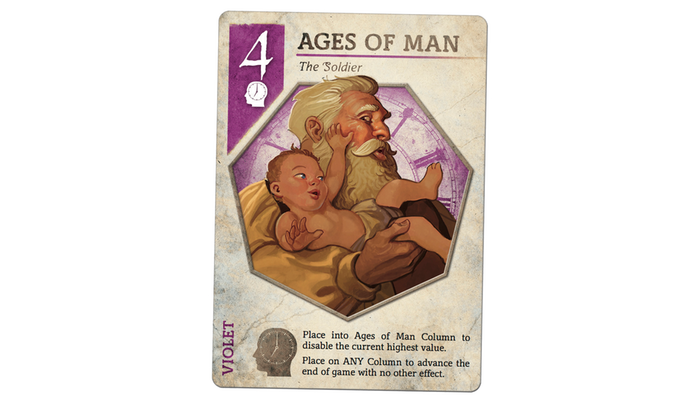 During the game, Ages of Man cards are played in any column with no effect, but speed up the game clock, inching closer and closer to the end. If you are sitting on a good hand, you might want to end it ASAP. The second thing they do is kill of high number values. So if they are played in their own column, they will make the highest value cards in play become 0’s. High value starts with 7 and works its way down to 1. As each Ages of Man card comes out, your high valued hand is looking worse and worse. Tom: That is a really cool mechanic. I like how you worked a game clock in. The decreasing value idea is neat and I can see how it can really change the game. Neat. What designers do you admire? Jason: There are so many. I watch and learn from every one that I interact with and every new game that I play. A few to note would be Rob Daviau (Risk Legacy still blows my mind, even 3 years later), Daniel Solis (he has better games in one tweet that I’ll have in 3 months) and Scott Almes/Seiji Kanai (as they both cram a lot of game into a little package). Tom: Daniel is local and a friend. You are right. He is really an under-appreciated designer. If he had more exposure he would really hit it off I think. You should see him playtesting. Wow. Scott is a machine. I’m working on an interview with him right now. He credits his output to a strict discipline of working on game design a minimum of 1.5 hours a day. I need to do this. So Jason, have you been rejected by a publisher? Is so, how did you handle it? Jason: I have and it can go two ways. You can be rejected with no additional info, which just leaves you confused as you have no clue what to improve. You can also be rejected with an explanation of why it doesn’t work, or why it doesn’t work for them. I’ve always picked up and tried to improve the game, but it’s a lot more helpful when you know what went wrong. Tom: In that interview with Scott he mentions, regarding Kickstarter that “a lot of publishers are not looking for filler-style games. They are looking for something more flashy, I guess. I have a hard time imagining a company putting up Coloretto on kickstarter, because it’s not that flashy.” I think he may be onto something here. I’m taking publishers in his quote to mean the larger companies – Asmodee, FFG, Rio, Queen, etc.. I get the feeling that they are more interested in larger games, the Queen Big Boxes for example. It’s the smaller companies (Dice Hate Me, Green Couch, Gamelyn, etc.) that are doing the ‘filler’ games. It seems kind of appropriate in a sense as a smaller company puts a lot more on the line if they go after a large game. TMG and Stronghold would be exceptions I think. What do you think? Jason: I think there’s a tough middleground. The big games sell very well, and the tiny micros make a solid dent, especially for their size and price point. But smallbox Coloretto sized games are tough. They need a very competitive price point and some sort of hook or they will get lost in the shuffle. Tom: I absolutely agree with that. The price point is really something that we are seeing as a defining factor in a campaign. The smallbox games above $20 are a hard sell in my opinion. If you can do one for $15 that’s a sweet spot. People will spend that on a game even if they don’t know the company or designer. The bigger games are getting very expensive too though. Averaging $60 I believe. What do you think is driving up the prices, other than normal production costs? Jason: I’m not 100%, but I think there are a few things that are Kickstarter-centered that will drive up the costs. Shipping is always brutal. So some of that money should be wrapped into the onslaught of shipping costs. Stretch goals are generally given away for free but planned from the start so creators may be upping their price a few bucks in anticipation of having to cover for stretch goals. I think the biggest thing is that were looking at small-ish companies that need to charge higher prices because they are ordering small quantities. They are often making some amazing quality games, which are not cheap. And since the production cost needs to come from a reasonable amount of backers that are within their reach, the retail price will hover on the high-end. Tom:What are some things that you have learned about playtesting? Jason: Testing takes a lot of time. Not only in just playing the game over and over, but in scheduling and traveling back and forth and prepping a new prototype for the next test. It’s definitely the “hard work” part of designing games and can be grueling at times. But at other times it’s magical and awesome. It all depends on the game, the state of it, the group and the setting. There are so many factors. Jason: How to juggle a lot of roles on a handful of projects at one time. In the past few months, I’ve probably spent 40 hours a week working on games. On top of working 45 hours a week at my day job. It can be a small hobby or it can be all-consuming. I’m very happy that it’s all consuming, but my real life could have been a little more prepared for it. Tom: After Seven7’s what’s next for you? Jason: I’m just wrapping up a game with the creators of the webcomic Homestuck. It’s designed by me and Jeff Quick and it’s a 2p head to head fighter and it’s going to be awesome. After that I have 60 Seconds To Save The World coming out from a publisher who hasn’t announced it yet, and on the Button Shy front I have a handful of little things in the works. Some are my designs, some are others. Tom: Button Shy is your recently launched game company. Why jump into the publishing pool? Jason: I started out doing small-time self-publishing years ago. It’s something that I love. I’ve run my own businesses before and it can be incredibly fulfilling when you see it grow. For games, it allows me to involve myself in all of the different areas of the industry. By publishing a game, I can be a better designer in the terms of working with publishers and understanding what makes them work. I can spot issues with a publisher from past experience. I can offer my assistance on certain parts of the development or publishing cycle that may not have been possible before. I also work on other games that aren’t my own. And for the company, it allows me to make some games that are outside of the norm with a quick release schedule. Tom: What do you look for in a game? Jason: I like to play games and experience something I’ve never experienced before. It doesn’t need to be a new mechanic, but that’s always awesome. I’m so excited when it brings out a new feeling or new outlook on gaming. Most importantly, I want to be moved by the game. Jason: Looking at my gaming shelves, I’d say Risk Legacy, Cosmic Encounter, Survive, Smash Up… but the truth it’s always the last prototype I’ve played. I love playing games by my designer friends or new designers. I’d almost always prefer to make a game than play an existing one, and it could be as simple as rolling word dice and making up movie titles with them. Jason: It’s interesting because I don’t watch a lot of cartoons. I don’t watch a lot of anything, but for some reason cartoons are at the bottom of my list. I wish I could pinpoint the reason, but I think I just don’t connect in the same way I connect to something like the IT Crowd or Curb Your Enthusiasm. But just recently my family has broken that tradition and gotten me really into Bob’s Burgers. That, and South Park. I will always adore South Park. Jason, thank you very much for joining me and talking about Seven7’s and other cool stuff. It was a blast. 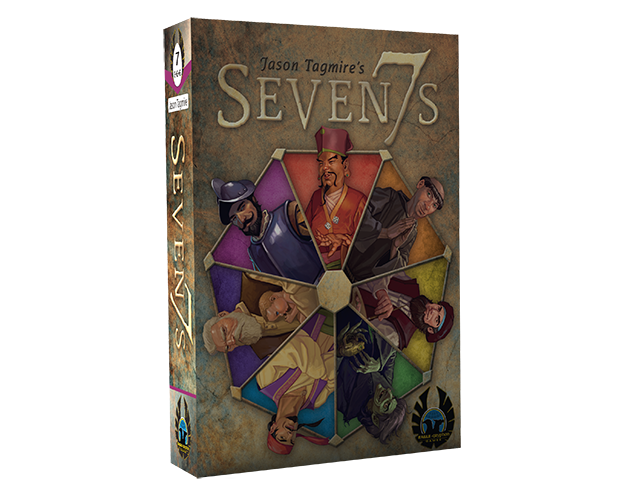 Readers, you can find the Seven7’s Kickstarter right here. The game is very inexpensive at $9 + shipping. You really should support it because it looks like a fast, fun game. There are only a couple of days left. Button Shy’s site is here. 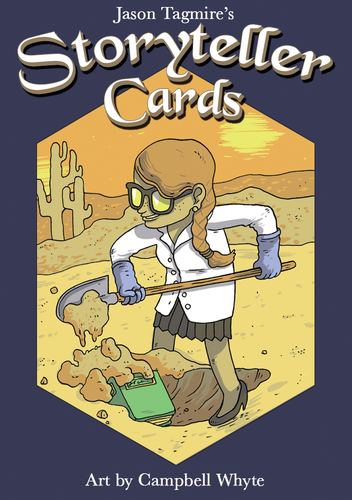 You can get Storyteller Cards there as well as Pretense and Movie Plotz. You can contact Jason via Twitter – @jtagmire. You can see him regularly on Something From Nothing every other Sunday night at 8pm.